The Gunsmith Tool Deluxe Kit from Weaver is an affordable 88-piece gunsmith kit designed to address almost any firearm maintenance task. 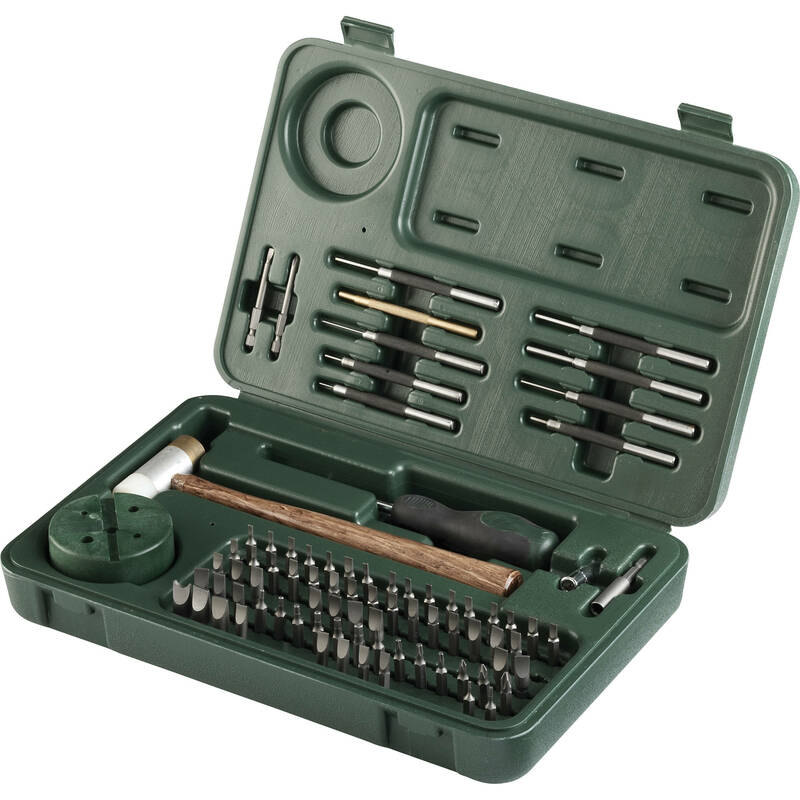 This kit includes an ergonomically designed magnetic-tipped hex bit driver for user-friendly operation, lengthening attachments for accessing difficult to reach places, and a latched hard shell case for easy storage and adjustments on the go. For precision adjustments, this kit also features a hammer with brass and plastic faces, and the included steel punch set is equipped with multiple sizes to fit a variety of pins. Whether mounting an accessory, punching out pins to replace a trigger, or separating a stock from a receiver, this kit has all the tools necessary to get the job done right. This 88-piece gunsmith kit includes an assortment of flat bits to fit a variety of screw heads, equipping this kit to handle almost any firearm maintenance task. Included steel punch set with multiple sizes to fit a variety of pins. Whether mounting an accessory, punching out pins to replace a trigger, or separating a stock from a receiver, this kit has all the tools necessary. Store all 88 pieces in the latched, blow-molded hard shell case that makes organization and transportation of this kit quick and easy. 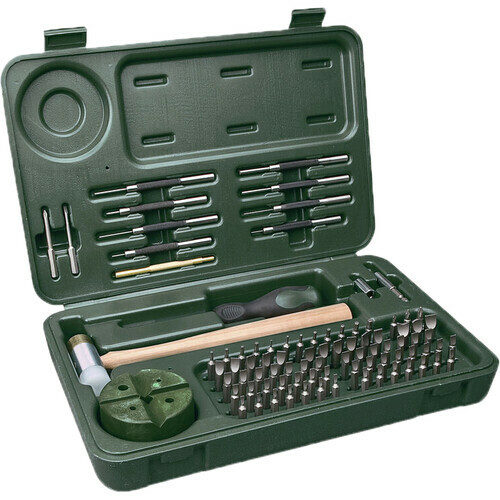 Box Dimensions (LxWxH) 14.8 x 9.5 x 3.1"
Gunsmith Tool Deluxe Kit is rated 4.5 out of 5 by 10. Rated 4 out of 5 by john from nice tool kit This is my first gunsmith tool kit and so far it has all the tools I need to get started. the green block doesn't work too well but is suitable for little jobs. the hammer is kind of cheap looking but does the little jobs. overall it's fine for what I'm doing. Rated 4 out of 5 by INVAZN from Useful Gunsmith Kit This kit has most tools needed for most odd end jobs. I have used it to mount a few scopes, replace the slide lock on a glock 20, and make multiple modifications to my AR-15. Everything worked as expected. Rated 5 out of 5 by Hank D from GunSmith tool kit I've only used the kit once but it gave me access to all the inner workings of my Marlin 336 30-30. I broke no tools or tips. I suspect that broken tips were abused in previous reviews. There's a tip for each screw slot that fits tightly and properly. I have several other guns I'll be taking apart and fully expect each gun will come apart easily if I can find the proper dis-assembly process sequence. I expect the kit will last me my lifetime. Happy Happy. Rated 5 out of 5 by Preston from Deluxe Gunsmith kit I've only use this kit on one pistol and the screw driver selection is great as is the mallet. I am looking forward to using it in some modifications to other guns. I not saying that this kit will work for everyone but I not hesitate to recommend this kit to anyone. Rated 5 out of 5 by Lay from Quality This is a very good price and a quality set of tools. You won't be disappointed and you don't have to worry about the right tool or damaging your project. Rated 4 out of 5 by Frank from Frank's Review Nice kit , Well thought out but used one of the screwdriver bits and the end of it broke. Didn't expect that to happen on first go. Rated 5 out of 5 by BullzEye from Deluxe Kit Every gunsmither's needed to kit. From the professional, to the amateur.